I need to add some music for the weekend to my MCX8000 standalone pen drive, and against my better judgement I tried to upgrade Prime when prompted. When I tried to install 1.2.2 I get the message below. Also tried as admin with the same result. Worse than that, it has also completely removed Prime from my PC and now I can’t do anything at all. Any idea guys or am I going to have to recover a backed up image to sort this out as I really need EP to be running for the weekend. I don’t want to rule out the “not so good” installer. But can you place an item or icon in that public desktop folder with your logged on account? Not sure why the installer would require access to that folder anyway? It wants to place the Engine Prime icon there. Just like an Adobe Reader does. Don’t know what to try next. Download file is not “blocked” when showing properties? Try perhaps with compatibility mode? I could zip my installed Engine folder for you to try. Seems quite computer specific considering no or else has said about this . Any internet security apps or system security running ? No 3rd party security. just Windows defender. 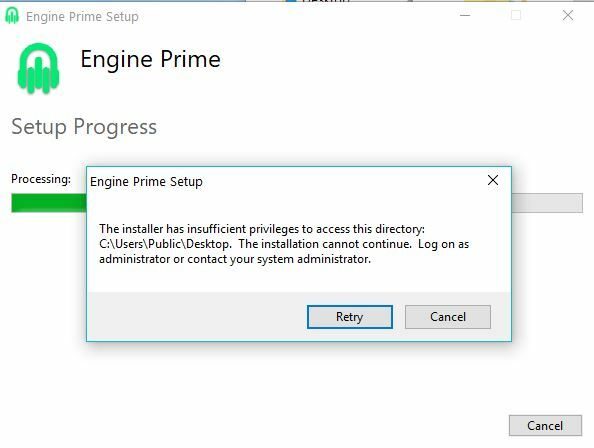 I ended up recovering a previous image overnight and it’s all working again, but it would be good to find out what the issue was as Prime will need updated at some point in the future. i know old thread but ive ran into a issue with the software cos it wont install on my PC at all just ends with a unknown error. I never got an answer so just stopped using Prime. I recovered a previous image and tried again but no luck. Prime is a terrible piece of software. Denon really need to get it sorted. I haven’t updated the songs on my MCX8000 in months now. Yeh so far that is all im hearing that the software is complete garbage and no one seems to answer questions asked about installation problems. I really dont wanna cancel my prime 4 but if i cant get the software to work then wats the point in having the new gear when it wont work. Denon really need to get an updated version of Prime out before the new controller hits the shelves. Totally agree because atm i cant even install it on my PC and a few of my m8s have tried it and it also wont install on theirs either. Come on Denon DJ start looking at ur prime software forums and work what the hell is going on. I have it installed on a Dell XPs 13 without much of a fuss. Windows 10. Installed on the dedicated Macbook pro as well. Never save to my desktop so it ain’t that and I’ve ran it many times as admin also no joy. Few of my friends tried to install and also came back same error. I’ll check the windows install service when I’m home. @mufasa saying it’s installed fine isn’t a answer on this to fix it is it. Info on how to fix is better then well it works on mine. Hello. I was just indicating that it installs on a PC I have. Could be something on your PC dunno. I’m sure the windows gurus here will chime in to help u troubleshoot. I know nothing about windows OS I’m primarily a Mac user. I didn’t do anything special to install it on the Windows PC. Did u try older versions btw? There is no point in trying a previous Engine version until troubleshooting is performed with the version he wants to install. As long as others installed and run the software on PC, he can do it also. It requires a little patience and attention to what he is doing. Eventually one thing will lead to another. Started windows install store service and yes it worked and installed. Your a star!